Download "Q&A RFP DND-15/0003477 Certified Project Management Training"
1 Q&A RFP DND-15/ Certified Project Management Training Number Question 1: Questions/Answers/Amendments I would like to request clarification in the RFP submission process for DND-15/ please. Reference Article 2.2b) and MT3 In Article 2.2b), page 5 of 36 under Submission of Requirements, the Department of National Defence has indicated that s exceeding five (5) megabytes may be rejected by the DND system and/or firewalls without notice to the bidder or the Procurement Authority. 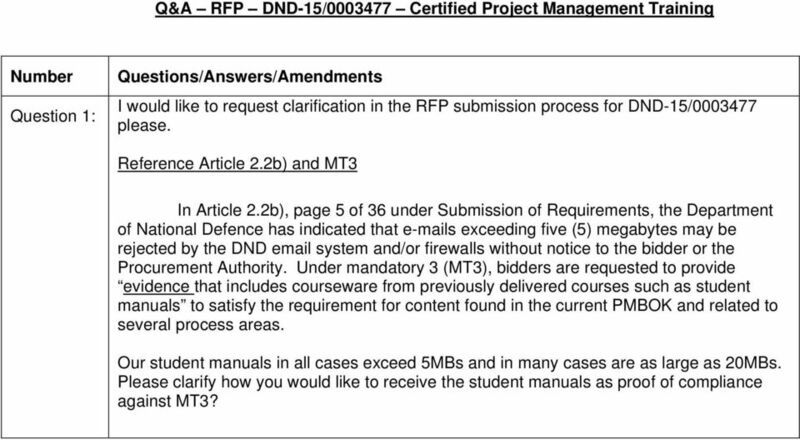 Under mandatory 3 (MT3), bidders are requested to provide evidence that includes courseware from previously delivered courses such as student manuals to satisfy the requirement for content found in the current PMBOK and related to several process areas. Our student manuals in all cases exceed 5MBs and in many cases are as large as 20MBs. Please clarify how you would like to receive the student manuals as proof of compliance against MT3? 2 Answer 1: PART 2 BIDDER INSTRUCTIONS, Section 2.1 Standard Instructions, Clauses and Conditions, DELETE: Section 07, Delayed Bids is deleted and replaced by: It is the Bidder s responsibility to ensure that the Contracting Authority has received the entire submission. Misrouting or other electronic delivery issues resulting in late submission of bids will not be accepted. 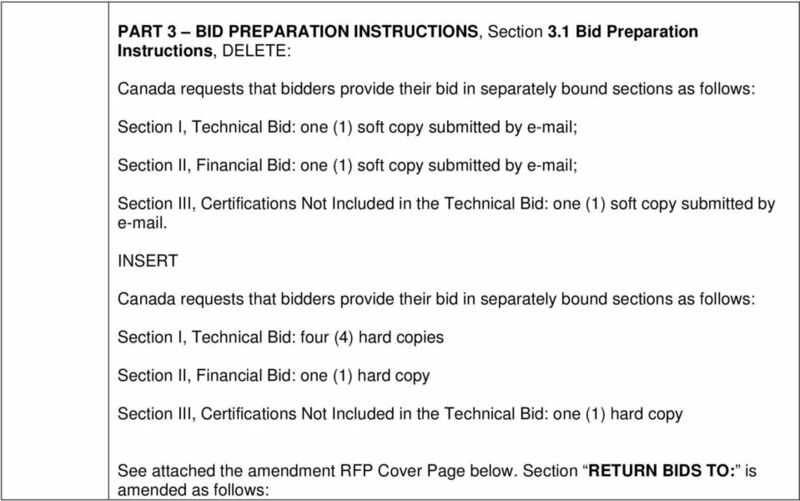 PART 2 BIDDER INSTRUCTIONS, Section 2.2 Submission of Bids is DELETED in its entirety and REPLACED with the following: 2.2 Submission of Bids a. A bid delivered to the specified address below after the closing date but before the contract award date may be considered, provided the bidder can prove the delay is due solely to a delay in delivery that can be attributed to the Canada Post Corporation (CPC) (or national equivalent of a foreign country). Purolator Inc. is not considered to be part of CPC for the purposes of delayed bids. The only pieces of evidence relating to a delay in the CPC system that are acceptable to DND are: i. a CPC cancellation date stamp; or ii. a CPC Priority Courier bill of lading; or iii. 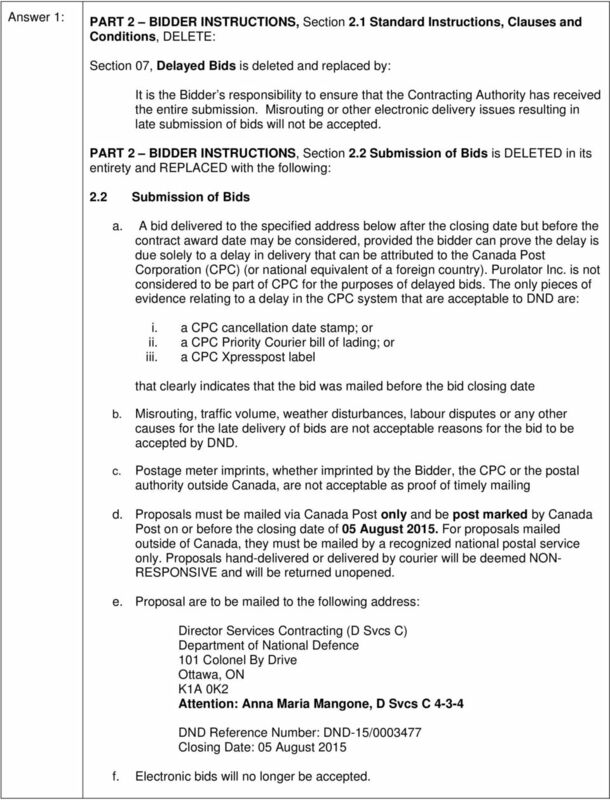 a CPC Xpresspost label that clearly indicates that the bid was mailed before the bid closing date b. Misrouting, traffic volume, weather disturbances, labour disputes or any other causes for the late delivery of bids are not acceptable reasons for the bid to be accepted by DND. c. Postage meter imprints, whether imprinted by the Bidder, the CPC or the postal authority outside Canada, are not acceptable as proof of timely mailing d. Proposals must be mailed via Canada Post only and be post marked by Canada Post on or before the closing date of 05 August For proposals mailed outside of Canada, they must be mailed by a recognized national postal service only. Proposals hand-delivered or delivered by courier will be deemed NON- RESPONSIVE and will be returned unopened. 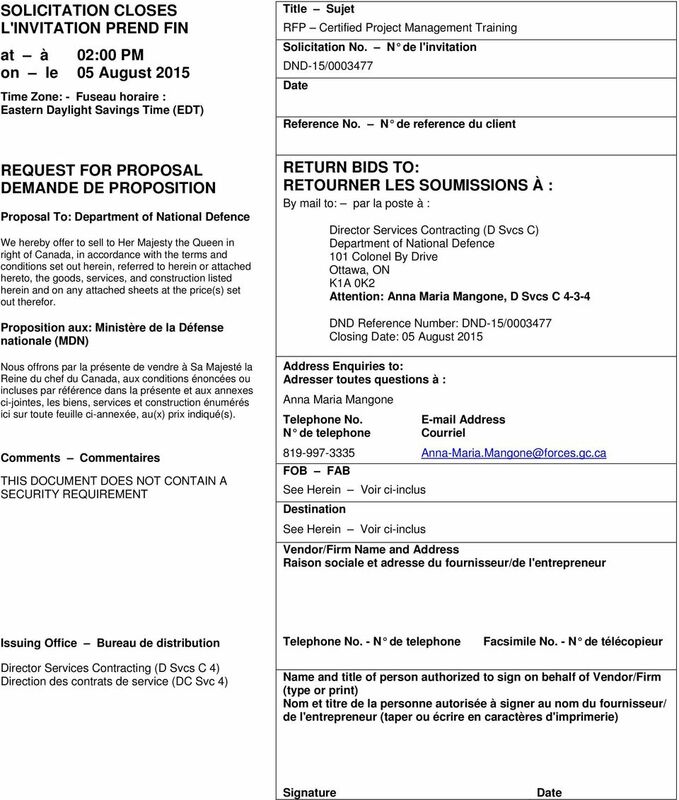 e. Proposal are to be mailed to the following address: Director Services Contracting (D Svcs C) Department of National Defence 101 Colonel By Drive Ottawa, ON K1A 0K2 Attention: Anna Maria Mangone, D Svcs C DND Reference Number: DND-15/ Closing Date: 05 August 2015 f. Electronic bids will no longer be accepted. Title Sujet Project Delivery Office Support. Solicitation No. Nº de l invitation 201502963. Solicitation Closes L invitation prend fin. Travaux publics et Services gouvernementaux Canada. Title - Sujet Petroleum products storage syst. SPECTRUM ANALYZER must be able to. Equivalent SPECTRUM ANALYZER must. spectrum analyzer. Equivalent. do the X, KU and DBS bands.